For years there has been a story going around about a woman who lived her whole life with a pencil in her head. Everyone knows that it is impossible. It must be an urban legend. When Margret Wegner was just four years old, she fell while carrying a pencil in her hand. She fell with such force that the pencil punctured her cheek and went up into her brain just above her right eye. Wegner describes the accident this way: "The pencil went right through my skin -- and disappeared into my head..."
At the time of the accident, doctors examined Margret and determined that the pencil had missed the vital parts of her brain. Unfortunately, they felt that the pencil was embedded in such a way that removing it would create a risk that was too great. In the 59 years that followed, Margret experienced chronic headaches and nosebleeds. She lived her entire childhood, teenage years and married adult life with a pencil in her head. 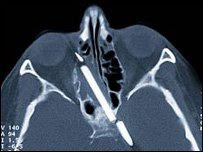 Fortunately, doctors at a clinic in Berlin decided that they would attempt to remove the pencil. They were mostly-successful in the surgery. However, the tip of the pencil was so completely embedded in Wegner's head that it could not be removed. Margret says she no longer has headaches and it was expected that she would be able to smell again.